Al Hartmann | The Salt Lake Tribune BYU Athletic Director Tom Holmoe, left, announces Kalani Sitake as BYU's new head coach at a press conference in Provo Monday, Dec. 21, 2015. Holmoe said Wednesday that he's had no discussions with Sitake regarding a potential contract extension. 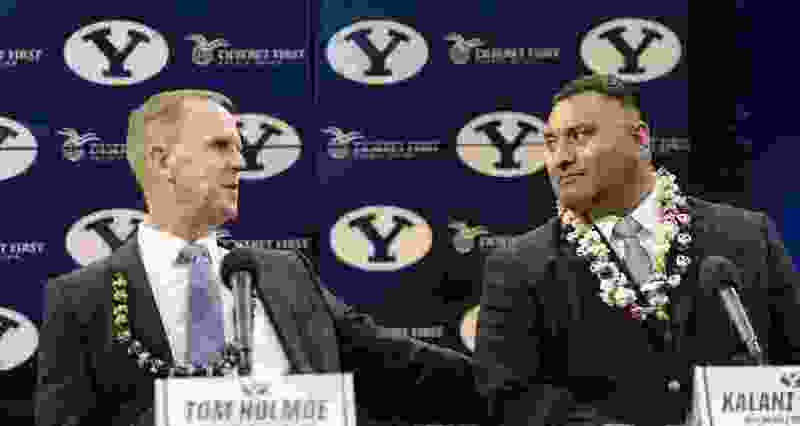 Provo • Although the industry standard is for schools to extend college coaching contracts when those contracts are two years away from expiring, BYU is not in a hurry to extend football coach Kalani Sitake’s deal that ends after the 2020 season, athletic director Tom Holmoe said Wednesday. In a far-reaching roundtable discussion with reporters, the longtime AD answered questions for 55 minutes but gave few clues about whether the five-year deal Sitake signed when he replaced Bronco Mendenhall in 2016 will be extended. The Salt Lake Tribune reported Sunday that Sitake has two more years on his deal, which is generally the time frame in which contracts are extended so coach’s can solidify their recruiting classes before national signing day the first Wednesday in February. The Cougars went 7-6 in Sitake’s third season, culminating with a bowl game win over Western Michigan. The coach is 20-19 overall. Overall, Holmoe said he was “very happy” with the 2018 season after the Cougars went 4-9 in 2017 and failed to reach a bowl game for the first time since 2004. Holmoe said he alone decides whether to extend or renew coaching contracts, but acknowledged he has “some dear, close confidantes” with whom he counsels. • Holmoe said he offered BYU basketball coach Dave Rose a one-year contract extension last November that will take Rose through the 2020-21 season because “I felt at the time it was the right thing to do.” The Cougars are a somewhat disappointing 13-9 this season heading into Thursday night’s showdown with No. 4 Gonzaga at the Marriott Center. • Holmoe said he is "grateful to Utah” for agreeing to extend the rivalry football series through 2024 and is excited about opening against the Utes on Aug. 29 this year. He said the 2019 schedule, released Wednesday, “would be wicked” if the teams that are on it are as good as they have been historically. • Holmoe said BYU has not heard back from the NCAA yet on its appeal of the ruling that would strip the school of basketball wins from the 2015-16 and 2016-17 seasons because guard Nick Emery received impermissible benefits from four BYU boosters. He said he hopes the matter is resolved in 2019. * Holmoe said the graduate transfer program the NCAA has that allows student-athletes to transfer and be immediately eligible is “under scrutiny.” He said that getting fifth-year graduate students into BYU is “even harder” than getting undergraduates into the school. * Holmoe said BYU will commemorate the 150th year of college football with several events at its games this season, including bringing back many former great players. He said Heisman Trophy winning quarterback Ty Detmer “will be first on the list,” although Detmer was fired as offensive coordinator after the 2017 season. * Notre Dame still owes BYU a football game in Provo after the Cougars played the Irish twice in South Bend in 2012 and 2013, but “there’s nothing new to report” on those negotiations, Holmoe said. Last June, the AD said BYU would prefer to get a game instead of a buyout check.